I have read an article where it states that the Metalhead is an idiot for not opening the mind… and I can’t be more agree with that, we are stuck in a glorious past that will never return, and expect to always find the same, closing the gate to bands that may have not the prestige or the big label supporting, and let me clear something to all of you: this band is not evolution, is not something that you haven’t heard before, but hell they are good, and that’s enough to get me into this review. 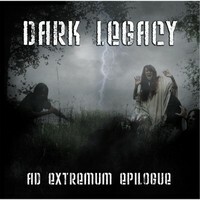 DARK LEGACY may be a cliché name, but that is not really important, and after hearing a couple of times this release (7 years after their first demo) and the touch of the nineties is all over the way, but with a twist in the years, something that makes this album sound a little different, and a lot better. The atmosphere is dark and mist, with keys filling the moment, and creating auras that surrounds the listener into something very rare, strange and peaceful, guitars are strong, hard but not fast, helping to create the moment, good riffs and few solos, perfect for this, the bass is very good, driving into rock and metal sides, but always with good taste of the rhythm, the drums come always in when they’re needed, they’re not fast’, not always slow, just go along with the songs, changing the tempos and breaking the sounds, the vocals are harsh, good, but a little plain for my taste, after all they fill well in the songs, what else can I ask?. Long short term: The album has the doom in all the way, despite de definition of Symphonic Death Metal, sounds like the straight evolution of KATATONIA, if they’d continued to this day with the "Dance Of December Soul"’s sound, they are young, they are beginning, and in my humble opinion I foresee a good future to this band, expecting more, expecting the best.